Option A shows an island surrounded by water, backdropped by an eerie grey fog. The author’s name and book title are in grey, black, and white fonts. Option B dominated the polls, earning a score of 80, whereas Option A only earned a score of 20. These scores were consistent regardless of age range or gender. Poll respondents also noted that the man looked mysterious, mostly because his back is to the camera. We’ve seen this before with poll results for book covers. People feel that book covers that don’t show the entire face are more mysterious and draw them into wanting to read the book. The word hint is key here. The author included just enough detail on the cover to give readers a sense of what the book is about, while still maintaining a level of mystery and intrigue. As you create a book cover for a mystery novel, considering adding elements that tell a part of your story. When including individuals, try not to reveal their faces so that you can maintain a level of mystery. 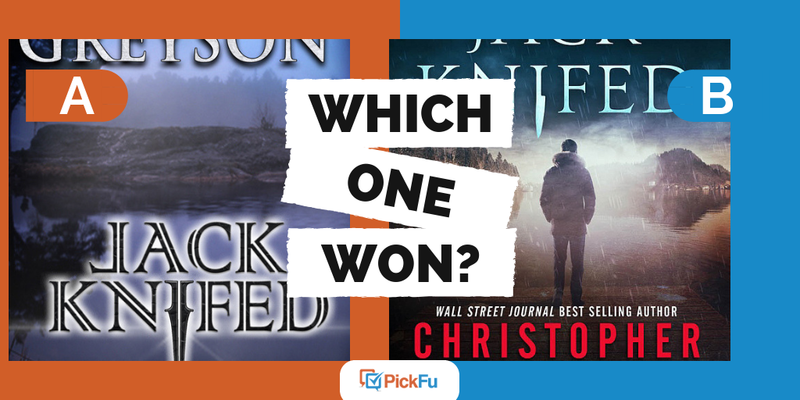 Once you have a few designs prepared, conduct a split test by creating a PickFu poll to see which option your target audience prefers.